Add all ingredients to mixer bowl, blend for 30 sec/speed 9/MC on. Scrape bowl down and repeat 2-3 times until smooth. Divide into 4 portions and freeze in snap lock bags. At step 1 add on extra processing time until paste is smooth. I’ enjoy the green curry paste and am about to give this one a go. Just wondering why the spice seeds are not pre-roasted in this recipe before blending? Thanks so much for so many great recipes! I just made four portions and froze them for later use. 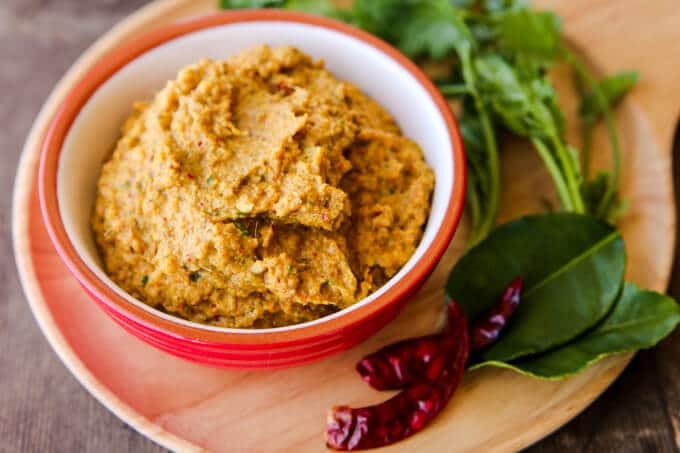 Could any of you please share a curry recipe in which you use this paste? It smelled amazing and I do not want to waste it. My guess is diced chicken, some coconut milk or Cream, but how long and when to add the paste etc?Thanks heaps!! The recipe for the paste is amazing with such authentic flavours, the curry was superb! Thank you Nik for continuing to wow us with your recipes! I’m so happy I can make this from scratch, and have three more batches in the freezer for more!! 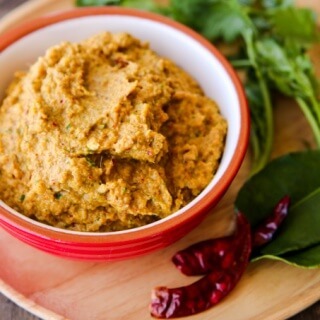 Hi – wondering if you have any suggestions for a vegetarian shrimp paste substitute? I’m struggling to find dried whole chillies…. we live in the hunter valley and don’t have many Asian grocers locally. Would fresh still be suitable? These are usually in the spice section of Coles and woo lies too. My local Coles & Woolworths don’t seem to stock whole dried chilli – should I just oven roast some myself for the same flavour? I didn’t even read the recipe properly so I used fresh chillies, I haven’t made it before to comapre with dried chillies but the curry was amazing it had just the right hotness for me and I would do it with fresh chillies again next time. If your in the Maitland / greenhills area there is an Indian / Asian grocer near the rta at greenhills. Sun supermarket 11/4 Garnett road east Maitland. He also sells the babas curry powder. Made this today, added more chilies as I like my curry HOT! Was so easy to make and tastes amazing in the curry. Froze three portions all ready for the upcoming few weeks for dinner. Hello. I was just wondering how long this would last in the fridge and/or freezer? Will last weeks in the fridge with the salt and oil. As for freezer – MONTHS!